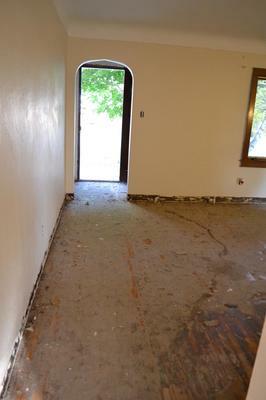 We purchased an older house that had multiple layers of flooring laid down on top of what we were hoping were the original hardwoods. We had a flooring company come out to give us a bid to hopefully restore our flooring to the original hardwoods and they said it could not be done. We wanted a second opinion, so we called Jerry Adamsson to come and look at our floors. Not only did he give us the best news that he could salvage our floors, but he could also restore them to their original beauty! This is what we were hoping for! Jerry was able to remove the hideous adhesives, repair water damaged spots, and patch holes drilled through our wood floors. The floors turned out so much more beautiful than we ever could have imagined! 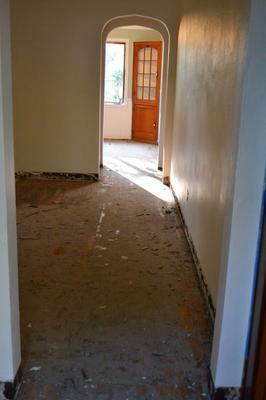 We pulled one layer of carpet, a layer of vinyl tile and wood underlayment, followed by another layer of vinyl tile with a very sticky adhesive applied to the original hardwoods. 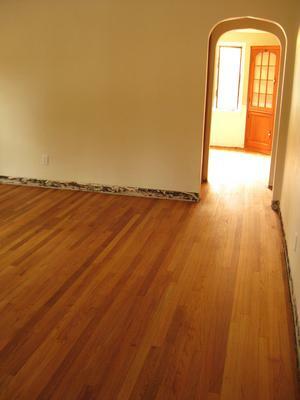 We weren't sure if we could even restore the hardwoods in the condition they were in. Jerry took one look at them and assured us that he would definitely redeem these hidden jewels to their original beauty. Jerry is confident and passionate about his work and it is very contagious! He also helped us with some exploratory finding that the hardwoods continued throughout our home, extending past the one initial room we discovered them in! 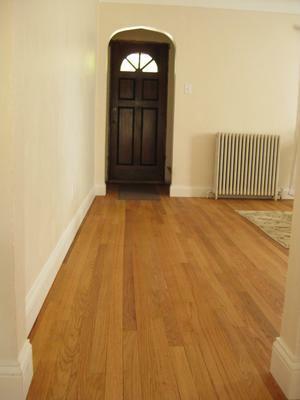 Not only has the restoration of our hardwood floors increased the overall value of our home, it helped our house feel cleaner and cozy. The beauty the floors brings to our house is indescribable and is one of our favorite things about our house. Jerry Adamsson's work provided an absolute night and day transformation! I especially want to point out to the readers that this floor was finished with a hardening oil, Monocoat. Monocoat is a great fit for older floors, especially, that have become brittle and need an oil like we old people need chondroitin and glucosomene for our brittle bones. You can read about more upsides to Monocoat elsewhere on the website. The only downside is its flat appearance. The floor has a sheen, but not the finish. The sheen is the wood, itself. For you purists, there is nothing between you and the wood. The feeling is that old-fashioned hand rubbed feel, not the poly-plastic feel. Return to the top of Floorwright, Jerry Adamsson Salvaged, Repaired and Refinished our Hidden Hardwood Floors!